The original windows of the church were made of plain glass. As the church was enlarged with the addition of the north and south aisles and the baptistry, it was richly endowed with stained glass given in memory of men and women whose untiring efforts brought so many benefits to the parish. Most of the windows show biblical scenes, and these helped to teach the people about religion in the days when many of them could not read. The separate pieces of glass each have their own colour and are set into strips of lead. The colours in early stained glass were each thought to have a meaning. The memorial window to Revd Fitz Wygram, 'The Transfiguration', for which £500 was collected by public subscription, is at the west end of the church. In the south aisle are a series of windows based on the parables, also given in memory of the first vicar by his wife and her mother, Lady Ward. The choice of the parables 'The Sower and the Seed', 'The Good Shepherd' and 'The Good Samaritan' is a particularly apt memorial to the man and his work. 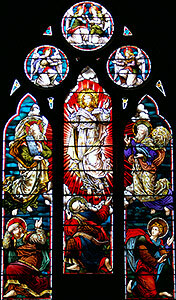 The great east window represents the Ascension, flanked by representations of the Nativity and the Visit of the Magi. In the baptistry are windows given in memory of Mrs Fitz Wygram, Revd Bligh and Revd Coad-Pryor, and the memorial window to the right of the chancel commemorates Revd Job. The north aisle is filled with memorials to such local families as the Pembertons, the Butlers and the Halls, and there are two windows representing King David and St Cecilia which were installed by public subscription to the memory of the first organist Mr William Singleton. Mrs Emma Bligh, Revd Bligh’s first wife, is commemorated by windows to the south of the chancel.